Senate D.C. statehood hearing: Skipped. 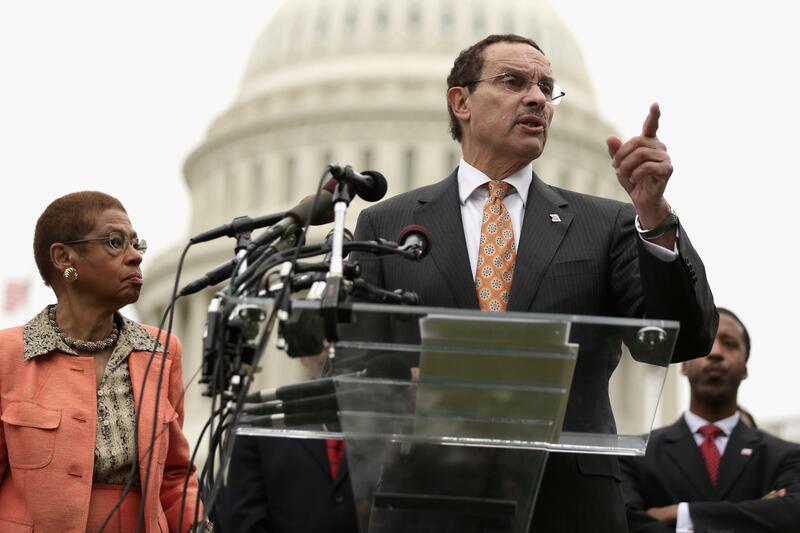 Washington, D.C., Mayor Vincent Gray speaks in front of the Capitol in 2013. At left is Del. Eleanor Holmes Norton. There are 645,000 residents of Washington, D.C., who, because of the way the Constitution was written, aren’t represented in Congress. (They have three electoral college votes, thanks to a 1961 amendment.) On Monday Delaware Sen. Thomas Carper held a hearing on a bill he’s introduced that would make D.C. a state. Carper was present, of course, as was what the Washington Post described as “an overflow crowd of hundreds” of D.C. vote activists. Oklahoma Sen. Tom Coburn, who called the bill a “legal and political absurdity,” at least went to the trouble of showing up. No other senators did. D.C.’s lack of representation in Congress and the fact that we still don’t elect the president by counting who gets the most votes are the two biggest unforced errors in American democracy, and the fact that neither problem is close to getting fixed is solid evidence that we are headed for a thousand-year fall from power à la Rome and the Miami Heat.